Mrs Tay admits that the web and social media are a mystery to her, but that she LOVES working amongst children! She’s also great at communicating via ‘What’s App’! 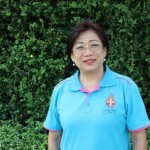 Currently President of GB Singapore Mrs Tay brings tremendous experience to the role of IVP for Asia, and the International Leadership team is blessed to add her wisdom to the team as GB moves forward in this next phase of mission. As a teacher she brings a wealth of knowledge to the team, and has travelled around Asia supporting the extension of our mission into Thailand, Cambodia and more recently into Indonesia. Have you ever been asked to assume a leadership role you did not want to accept? The fear of leaving my comfort zone and trying new things always prompts my heart to say “No”, but I have learnt the importance of acting in obedience to God’s call – to do what God wants, not what is easiest for me; To take that first step of faith to commit everything to Him; To submit to him in humility and trust that He will go before me to enable and equip me for the challenges that lie ahead. We will all face challenges and tough decisions everyday of our lives. Alone, we are weak and uncertain, but if we wait and listen expectantly to God’s voice, He will always be faithful to guide us according to His will. God calls each one of us to be different. We work as different parts of a body and use our different gifts to enhance the work we are called to do. When God calls us and we respond, He works within our hearts to strengthen and empower us. Is God calling you out of your comfort zone? Align to God’s will. Act with boldness in accordance to God’s will. Ask for prayer support on your journey. Inculcate good habits and spiritual discipline. Be Intentional in all you say and do. Trust in the Lord and stay True to your calling. Allow God to transform you as He leads you daily. In the Girls’Brigade, we believe that we are on God’s Business (GB) everyday. Be expectant of His working in every moment of life, for God takes our ordinary lives and makes it extraordinary. President, The Girls’ Brigade Singapore.